Because every card has a story to tell, bigDAWGS’ musical greeting cards are for the moments that we can’t put into words. With bigDAWGS, you can personally design your own greeting card with a customized sound of your choice. We are here to help you by showing you the right way to care. No matter the occasion, we make the perfect card to complete the celebration. 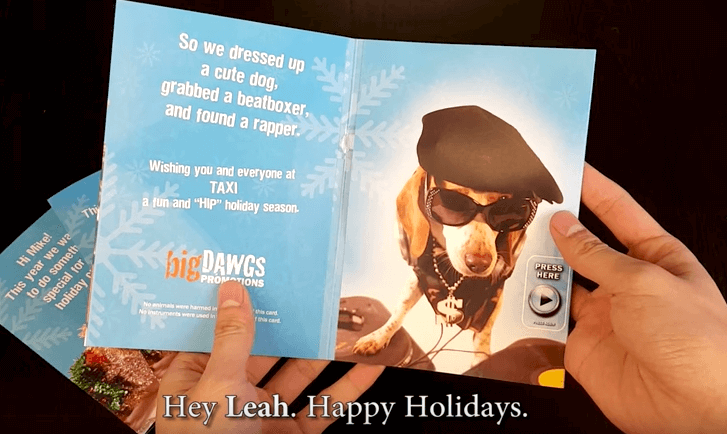 So this holiday season, we decided to dressed up a cute dog, grabbed a beatboxer and found a rapper. Sending you our holiday greeting card as a thank you for an extraordinary year. Wishing you and everyone in your company a holiday filled with love and joy.